Capture The Flag!! New competition! Which is better: British or American? Head-to-head, a War of Independence Rematch, British versus US pressing. 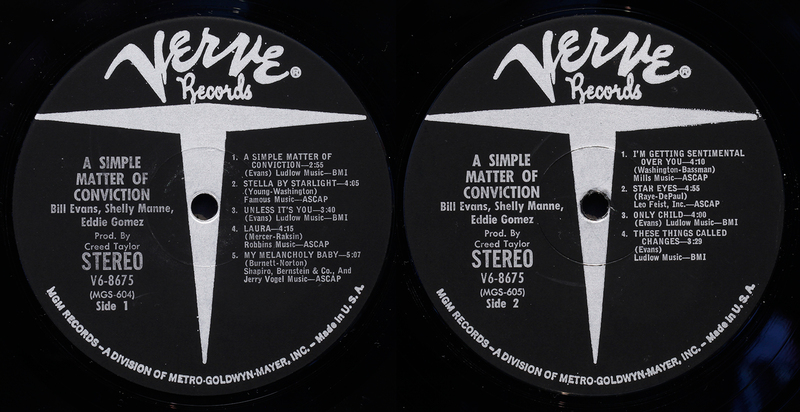 The scientific test, a Bill Evans recording from 1966, the rather beautiful “A simple Matter of Conviction” on Verve. For reasons I will share later I have both a US and a UK original release of this recording. The American is Van Gelder mastered (machine stamp in run out) and in theory is the closest to the master tape and so should see off any competition. 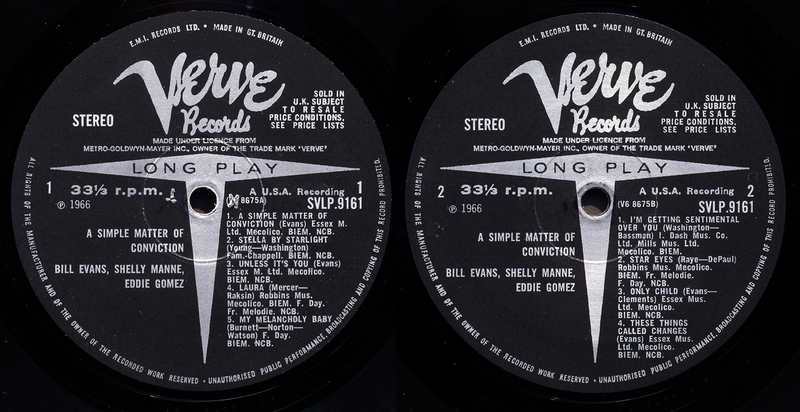 I was surprised to see a Van Gelder stamp on a Verve – my first – but I read he worked for a range of labels, not just Blue Note and Prestige. The UK release will have been mastered in the UK from a copy tape sent from the US. Conventional wisdom says the British pressing has no hope. It starts at a disadvantage being mastered from a copy of the original tape not the original. Worse, how can some backroom technical grunt in EMI engineering hold a candle to the sainted Rudy Van Gelder? It has to be game set and match for the American press. Theory is one thing, however evidence quite another. Caveats: I am a hostage to my USB TT which I use for ripping vinyl to MP3. It is not greatest quality and possibly not capable of capturing the fine detail of each record. Equally, you will be hearing them both on PC speakers which may be incapable of replaying the fine detail. However the future of the Special Relationship hangs in the balance. This is a two hundred year overdue Grudge Match: Redcoats versus striped fancy-pants and we are still sore losers. Lets hear it for the plucky little guy. Now back to the competition.I can tell you there are significant differences between the UK and US pressings, listening on a revealing hi-fi system. And one is clearly better than the other. But which? 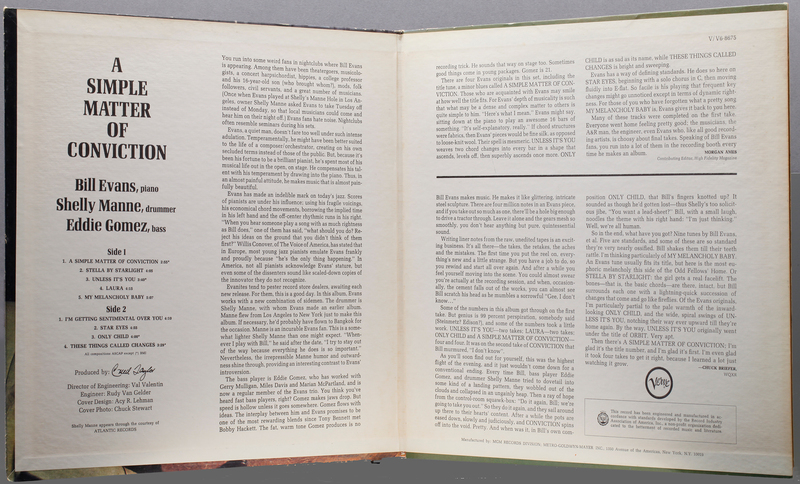 Economy British sleeve which is a modest flipback compared to the US gatefold. I willingly concede the American artwork is superior, it’s no contest. The reason I have two copies is not one I am proud of, but there are some important lessons to learn which are worth more than the immediate vinyl in question. Last year I was delighted to find an US original in a second-hand record store. Tragically it was damaged during handling. An inexplicable slip from the sleeve and it skated across the table to the floor, striking a chair back on the way, which left a noisy scuff in the thin vinyl. I was mortified – only the second time I have had an “accident” handling vinyl. One difference, on my listening, is the artistic judgement made by the engineer on the level of each instrument in the trio. The EMI mastering offers three independent musicians with Shelly Manne quite forward and given equal status to Evans piano. The Van Gelder is strongly focussed on the piano with some rather subdued musicians supporting in the background. It is a Bill Evans record after all. That is perhaps personal taste in the mix. Apart fom artistic differences, to my ear the British press has a brighter top end – cymbals sizzle deliciously – and the bass is more “tuneful”. But that is just my take, your mileage may vary, and your listening equipments certainly will. This test has reminded me that theories are not necessarily always a good prognostic of results. Experience offers you a much better story. One reminder, as my mother used to say, there is often something good comes out of something bad. Had I not scuffed the original press, I would not have pursued a replacement, and I would never have learned about the differences. Life never ceases to surprise and amaze. The final lesson I learned is that thin vinyl with relatively shallow groove is extremely vulnerable to surface damage. I have 220gm Plastylite’s you could clog-dance on and it would not make a sound as the music is all buried in the deep groove. This featherweight Verve vinyl tanked just by looking hard at it..
About the competition, if you can’t hear any difference, just enjoy the music. Its great. 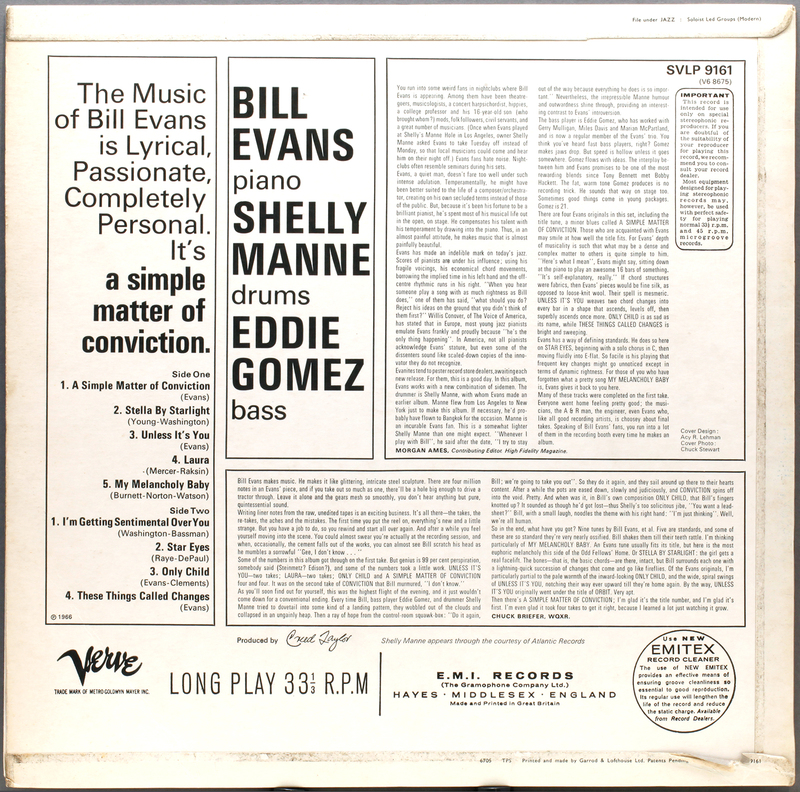 This entry was posted in Bill Evans, LondonJazzCollector, Verve and tagged Bill Evans, Eddy Gomez, Shelly Manne by LondonJazzCollector. Bookmark the permalink. My US copy of this LP is very worn out, looking for another copy I came across this post which is very interesting. I am a professional mastering engineer and I want to point out that when mastering, the engineer has no control over the mix levels of the instruments, only some controls for tone and dynamics. I think it’s unlikely anything at all would have been deliberately done to these recordings in mastering and that the differences you can hear are solely down to different tape machines / cutting lathes being used and perhaps due to the UK version being a 2nd generation copy of the master tape. They both sound nice though, UK one a bit brighter. I have a US mono original, and it’s not flimsy or thin. Funny that the stereo would be. Maybe they were pressed at different plants…? Either way, the music is great. I don’t think this is a great Van Gelder recording, however. Especially for a mono mix. RVG’s mono mixes were always punchy and dynamic. This sounds OK, but that’s it. 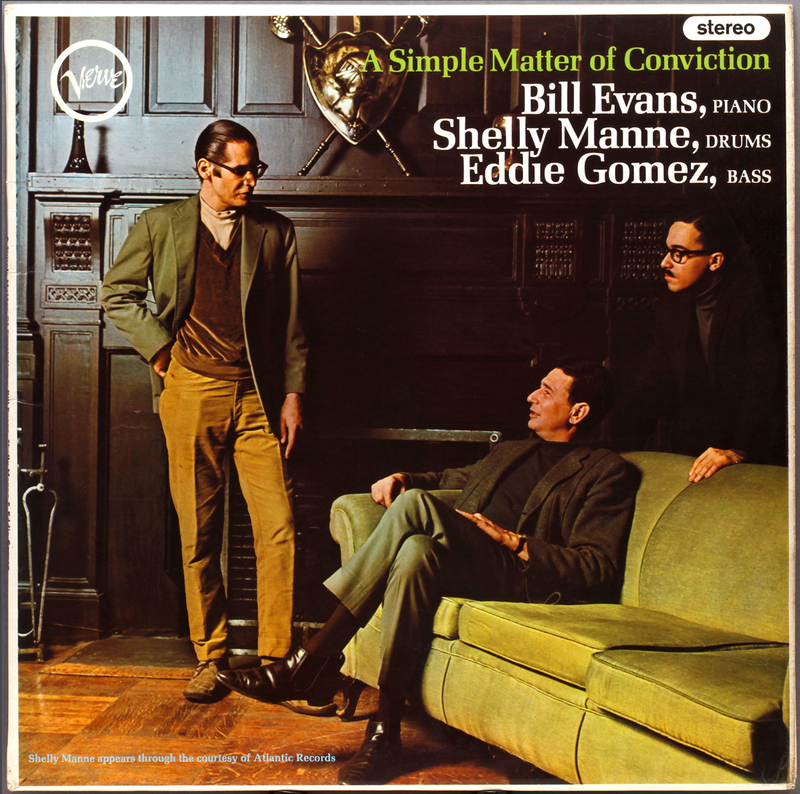 It’s just OK. Shelly Manne’s drums sound great, and Eddie Gomez’s bass is very present, but kind of dull sounding, and Bill’s piano could be a little more clear. Perhaps the stereo doesn’t have these issues…? I have Bill’s other album with Shelly Manne (Empathy) in stereo, also a Van Gelder recording (no Van Gelder in the deadwax though, weird…) and it sounds good. Bill in the left channel, bassist Monty Budwig in the center, and Shelly on the right. I love the cover on this one as well. Bill is holding court, he and Shelly look like they’re sharing stories of past gigs and experiences in jazz, and Eddie is intently listening, soaking up all the knowledge from these greats. I have an original stereo pressing and while it sounds OK it’s nothing special sonically, I think it’s the recording not a mono/stereo thing. The cover indeed is a great shot, very evocative! I have a US cut out of Empathy, with a stereo cover, but the record inside is monaural. The sound is excellent. I find the music O.K. but prefer the “integrated” approach of Bill’s regular groups. Shelly is a very gifted percussionist and is heard to great advantage on a par with Bill. Shelly was a jack-of-all-drums. He sounded right with Henry Mancini, and he sounded right with Ornette Coleman. And both in the same year. One thing where I will say the UK did better without question. The pressing. Many a MGM Verve pressing from the USA was a crapshoot. And that was when these records were brand new. Some pressings sounded fine and had decent surfaces. Some were swishy and noisy. Some in between. The UK and German pressings were superior over 90% of the time. I’m with you on this one Kent. Quite a few US labels – I point my finger also at Riverside, United Artists and Prestige New Jazz – did a great dis-service to the music they released, with compromised engineering and pressing. At the same time, Columbia, Blue Note and Impulse produced awesome quality. This is no place for flag waving, but for seeking out the best, from experience. I have some different pressed albums too, and I have to agree in some instances the UK pressings are superior to the American first pressed equivalents. Some of the Vogue pressings are extremely heavy weight vinyl and direct sounding. But I think the pressing has something to do with this rather than the mastering. Bill’s music has always had a special significance to me, perhaps it has to do with the way in which he seamlessly joined french impressionism with Bebop . Not many people could pull off such a combination, but he did it with pure class and tasteful lyricism. Kind of puts the “talent shows” on mainstream television into perspective. If only Bill had a dancing dog or could do back-flips…Here you have, as you say, pure class. Wonderful, treasure it. It’s such a great cover. I almost bought a copy just a few weeks ago but didn’t because I thought it probably wasn’t essential…. Anyhow, in the kitchen (a long, long way from this grand drawing room) grouse are being prepared. Martinis (that have lingered long with the gin bottle but cast scarcely a glance at the vermouth) are about to be handed round. Plain Luckies or maybe something imported circulate. The wine is opened to breathe. Someone says, Hey, why don’t you put some music on…. Country hotel, tourist excursion leaflets in reception, dark wooden panelling, stale cigarette smell from ashtrays. All that brown, slacks, and roll-neck beneath the v-neck beneath jacket, and brilliantined hair, meet in the bar for drinks before dinner, isn’t it marvelous? I just love that cover. The music is great too, not at all what I was expecting, it lives up to the Evans LaFaro legacy. Go buy. British, of course. However, just shows that what sounds “right” is pretty subjective. Just been introduced to Japanese shm-CDs, which for you vinyl guys benefit, uses a different type of plastic for the cd instead of the regular ol’ stuff. They definitely sound different when you do an a/b test. But wait, which version of the master has been used, have the levels been boosted on the shm version, etc. and so the debate rages on (in the online world and between me and my credit card – shms are 2 to 3 times the cost). And I’m now on the hi-fi upgrade drugs again, had forgotten what that was like. How can a sane person (debatable) go into a shop to buy a basic digital cable and come out £250 lighter? It’s only a piece of coaxial cable with two connectors. But my ears told me different. As LJG says, just enjoy the music. Cables can make a big difference, my ears say so too, but the upgrade that made the most difference for me was “balanced mains”. Its all voodoo, but balanced mains is definitely good juju. Why not have two copies? I have a friend that says “it can’t hurt to have a few a copies of a record you really like”. Helpful/harmful advice for sure that I’ve followed a little too much. You remind me of the definition of the true collector, who has three copies of everything. One to keep pristine unplayed, one to play, and a spare in case anything happens to the other two. I haven’t taken it that far, but I will hold onto a couple copies of a record if I really like it. Actually have a row of “doubles” lined up right now–gotta go through and pick the “keeper”. Bordering on the obssesive. But I like it. I work hard to make the things that I enjoy no fun at all. No contest. The Stereo version is much better in my opinion! Eh…actually they are both in Stereo! And by the way….That was quite a bit of fun! Not everyday I get to A and B Evans. Thanks! So if I understand you correctly you’re not necessarily stating that Van Gelder’s pressing sounds bad or worse, but really different. Still it’s a wee bit startling to know that, in this case, the RVG mastering doesn’t come across as we’d expect it to. In the rush to get out a post, I wasn’t clear what I was thinking, good call. I have tidied up the post under the Collectors Corner to spell it out better. The Brit sounds more like I would have expected the Van Gelder to sound, but then you have the influence of Creed Taylor, who would have had a say. You wonder what the conversation between Creed and Rudy was. Van Gelder didn’t have any input to previous Bill Evans recordings for Riverside, so this is a wild card. rvg version: Mixed to my taste, cleaner sharper overall sound and alive. the emi sounds like a flat carbon copy. Not the same personality as the rvg. As if the emi engineer couldn’t make a decision about mixing and just kept the levels straight as possible. The votes are all in from New York now, and it looks like Rudy is in the lead. Exciting!